Shaft misalignment can lead to wear of components and premature failure. Misalignment occurs when the motor drive shaft is not in correct alignment with the load, or the component that couples the motor to the load is misaligned. This misalignment may be caused during assembly or develop over time due to thermal expansion, components shifting or improper reassembly after maintenance. Unless corrected, misalignment leads to increasing wear in mechanical drive components and likely premature failures. Many professionals believe that a flexible coupling eliminates and compensates for misalignment, but a flexible coupling only protects the coupling itself. 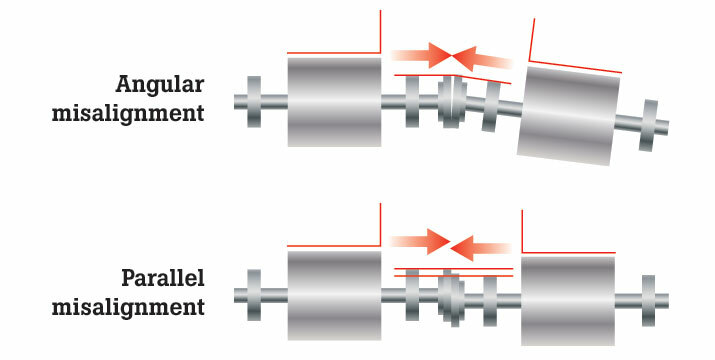 Even with a flexible coupling, a misaligned shaft will transmit damaging cyclical forces along the shaft and into the motor, leading to excess wear on the motor and increasing the apparent mechanical load. Angular misalignment: shaft centerlines intersect but are not parallel. A Fluke 830 Laser Shaft Alignment Tool can measure and diagnose misalignment issues as well as easily guide a technician to realign a shaft to its proper working order.